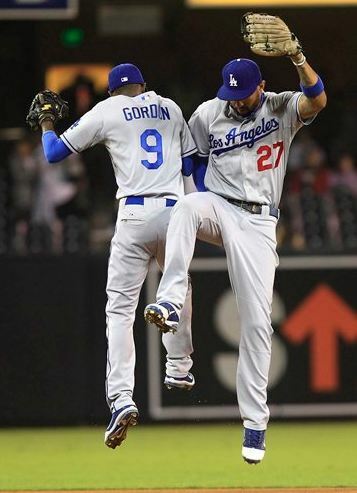 The Dee Gordon – Matt Kemp victory celebration is a thing of the past. Ron Burgundy would be going crazy right now if he were in “Sahn De-ago”. After a bunch of minor moves and a couple of big ones, there was a flurry of active Wednesday night and Thursday morning. The team that was the busiest was the Los Angeles Dodgers, which dealt star outfielder Matt Kemp, young second baseman Dee Gordon, and veteran Dan Haren (who may retire instead). Kemp, the runner up to the 2011 NL MVP/Prize Winning Cheater Ryan Braun was sent to the San Diego Padres along with catcher Tim Federowicz for catcher Yasmani Grandal, pitcher Joe Weiland, and prospect Zach Eflin. The Dodgers will also include $32MM to cover part of the $107MM still owed to Kemp. The 30-year old had an explosive season in 2011, when he led the league in home runs (39), RBI (126), total bases (353) and runs scored (115). He also won his second Gold Glove Award and second of three Silver Slugger Awards. Injuries derailed Kemp’s career in the 2012 and 2013 seasons, but he bounced back nicely last season. After a slow start, Kemp put up pretty good numbers – 25 HR, 89 RBI, and a .506 Slugging Pct. Grandal is a 26-year old former first round draft choice (12th overall picky by Cincinnati in 2010), who has 216 games of Major League experience. He topped 100 games played (128) for the first time this past season and produced 15 HR and 49 RBI to go along with a .728 OPS. The Padres acquired him in December, 2011 as part of a four player package from San Diego in return for pitcher Mat Latos. Plain and simple, this was a salary dump by the Dodgers. The Dodgers also acquired shortstop Jimmy Rollins from the Philadelphia Phillies for Eflin and Tom Windle. The Dodgers sent second baseman Dee Gordon, who stole 64 bases last year, pitcher Dan Haren, infielder Miguel Rojas and a player to be named later/cash to the Miami Marlins for prospect Andrew Heaney, 1st baseman Enrique Hernanedz, catcher/infielder Austin Barnes, and pitcher Chris Hatcher. The Dodgers also did business with their SoCal rivals, the Los Angeles Angeles, acquiring Gordon’s replacement, Howie Kendrick, for Heaney. The nine-year veteran can be expected to hit in the .290s with some power and about 14 steals (he stole 14 bases in four of the last five seasons). Heaney was the 9th overall pick by the Marlins in the 2009 draft and made his Major League debut last season with five starts and two relief appearances. The results were not good, but the left-hander pitched very well in a minor league season split between Double- and Triple-A. Yoenis Cespedes was used by Oakland at July’s trade deadline to land Boston ace Jon Lester. Now the Red Sox have used Cespedes as part of a package to acquire right-hander Rick Porcello from the Detroit Tigers. Pitchers Alex Wilson and Gabe Speier are headed to Detroit with Cespedes for the New Jersey native who had a breakout 2014 season. The 27th overall pick in the 2007 draft, Porcello topped 200 innings for the first time, won 15 games, and had a career best 3.43 ERA. Cespedes drove in 22 runs in his first 24 games with Boston, but slumped over the last month of the season. Detroit then went out and got Porcell’s replacement, sending shortstop Eugenio Suarez and pitcher Jonathan Crawford to the Reds for pitcher Alfredo Simon. Used as a reliever in five of his six previous seasons, Simon was a full-time starter for the Reds this past season and made his first All-Star team. The 33-year old neared 200 innings pitched, won 15 games, and put together a respectable 3.44 ERA and 1.207 WHIP. Suarez could have a shot at the starting shortstop job, with incumbent Zack Cozart coming off a sub.-600 OPS season. 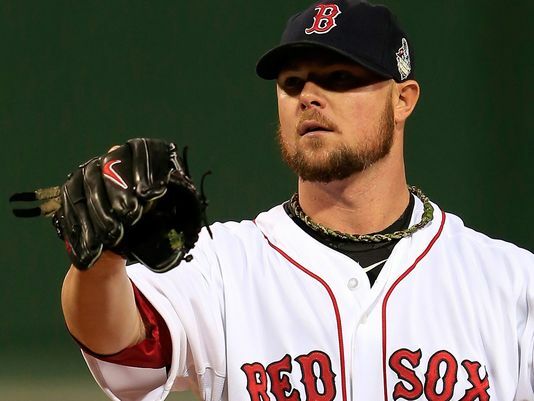 Jon Lester says good-bye to Boston. All along the thought here was that Jon Lester would return to the Boston Red Sox, the team he played for eight-plus seasons until a 2014 deadline deal to the Oakland A’s. But the free agent lefty instead opted for a reported six-year, $155MM deal with the Chicago Cubs. The deal, which was agreed upon late Tuesday night, includes a vesting option for a seventh season that would bring the total worth of the deal to $170MM. According to ESPNBoston.com’s Gordon Estes, the Red Sox top offer was six years for $135MM with no vesting option included. Lester, who doesn’t turn 31 until January, was 16-11, 2.46 in 32 starts (21 with Boston) between the Red Sox and A’s last season. The pending free agent was dealt with outfielder Jonny Gomes to the A’s on July 31 for outfielder Yoenis Cespedes and a draft slot. Cespedes has been the subject of trade rumors, which now may pick up with the increased need for a front of the rotation starting pitcher. The Red Sox reportedly made a one-year offer to bring back another former pitcher, Justin Masterson, but the righty struggled last year with Cleveland and St. Louis. You can expect renewed talks with the Philadelphia Phillies for Cole Hamels. New Cubs manager Joe Maddon was more than happy to have an old AL East nemesis on his team. “He’s been [to the World Series] before. He understands what it feels like. I want to believe that he could foresee the same thing happening here,” Maddon said. Baseball free agency…expect the unexpected. What’s not unexpected is the reaction by some Red Sox fans to Lester’s departure. 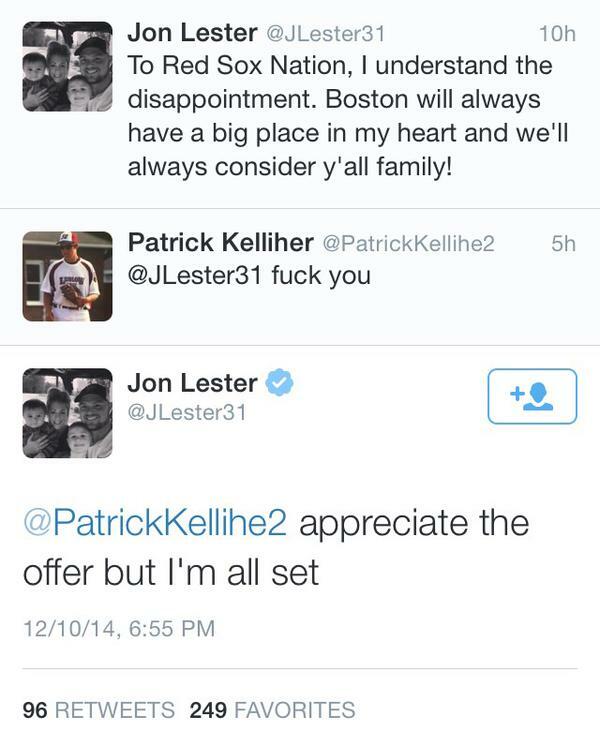 Lester took to Twitter to thank the fans and then delivered a witty response to one cranky New Englander. With the winter meetings commencing in San Diego Monday, there should be a handful of big named players that are dealt, signed, or talked about in the coming days. Jon Lester and Matt Kemp are the two biggest names that are constantly creating a buzz on the line. It’s clear that Lester will set the bar for free agent pitching with his signing almost certainly to come before that of fellow free agent pitchers Max Scherzer and James Shields. UPDATE – ESPN’s Buster Olney has reported that a decision by Lester is expected between Monday night and some time on Tuesday. The only reported contract that has been offered to the left-hander is a six-year, $138MM deal that the Chicago Cubs have served up. On Saturday, Red Sox owner John Henry flew to Atlanta to meet with his former star to see if a deal can be struck to bring Lester back to Boston. You can be sure Henry flat out asked what will it take, and will certainly be looking for a hometown discount. Especially after the boatload of money given to free agents Pablo Sandoval and Hanley Ramirez. The Red Sox rotation for 2015 is, at the moment, Clay Buchholz, Joe Kelly, Rubby De La Rosa, Alan Webster, and either Anthony Ranaudo or Brandon Workman. Even if Lester returns to the Red Sox, whom he played parts of nine seasons for until his trade to Oakland at the July deadline, the Red Sox will be looking to acquire another proven starter before Spring Training. In dealing John Lackey and Lester, the Red Sox received outfielder/1st baseman Allen Craig and outfielder Yoenis Cespedes. Boston appears to be willing to move one or both to strengthen their starting pitching. Rumors flew on Sunday that the Red Sox and San Diego Padres were discussing a Cespedes for Ian Kennedy deal. Kennedy bounced back from a rough 2013 season with 201 innings pitched, a WHIP under 1.3 and a 3.63 ERA in 2014. He finished 13-13 to remain 13 games over .500 in his career. Cespedes started hitting like a house afire when he joined the Red Sox (22 RBI in 24 games), but ended up with a .719 OPS in 51 games after a weak September. The Los Angeles Dodgers continue to look for a new home for outfielder Matt Kemp. Bob Dutton of the Tacoma New Tribune reported Saturday that Dodgers and Seattle Mariners were close to a deal, but the Dodgers insisted that one of Seattle’s top pitching prospects – Taijuan Walker or James Paxton – be included in the deal. Seattle responded with a big “NO” to that. According to FoxSports’ Jon Morosi, the Texas Rangers have now joined Seattle, Baltimore, and San Diego in pursuit of Kemp. Bob Nightengale of USA Today believe the Padres are the likely landing spot for the veteran outfielder. Kemp isn’t the only Dodger being shopped. LA spoke to the Arizona Diamondbacks about a swap that would sent first baseman Andre Ethier to the desert for catcher Miguel Montero. A potential deal was negated by Arizona ownership, per FoxSports’ Ken Rosenthal. Trading within the division is always a tricky thing and it’s understandable that front offices get nervous about a player coming back to haunt them 15-20 times a year. The market for Melky Cabrera is beginning to heat up. The Mariners are reportedly very interested in a Melky – Robinson Cano reunion. The contract could be similar to the four-year deal the M’s gave Nelson Cruz. The San Francisco Giants, who the Melkman played for in 2012, are also showing interest. Cabrera missed the last 50 games of the regular season due to his Biogenesis suspension and the Giants decided against bringing him back for the playoffs. Pitcher Jason Hammel appears headed back to the Chicago Cubs, per the NY Post’s Joel Sherman. Hammel was dealt by the Cubs to Oakland at the deadline last season and subsequently bombed. ESPN’s Adam Rubin reported that the New York Mets, very much in need of a shortstop, have talked to the Mariners about Chris Taylor and Brad Miller. Wilmer Flores is the Mets shortstop in the meantime. Rosenthal’s sources say the Milwaukee Brewers are open to dealing outfielder Gerardo Parra. The 27-year old was sent from Arizona to Milwaukee for a pair of minor leaguers at this past season’s trade deadline. Bob Elliott of the Toronto Sun has the Blue Jays talking to the KC Royals about closer Greg Holland. The Royals need to replenish their starting pitching with the likely departure of free agent James Shields. The Royals have a number of hard throwing relievers, with Kelvin Herrera as the favorite to replace Holland if he’s dealt. The price for Holland would be steep after the 29-year old saved 93 games and blew just five opportunities over the last two seasons. You would be fired up too if someone offered you more than $16MM a year. Baseball’s Winter meetings will convene in San Diego this weekend…SoCal in December vs Northeast in December…sigh…’nuff said. A number of rumors concerning free agents and possible trades have been floated out there as the weekend approaches. 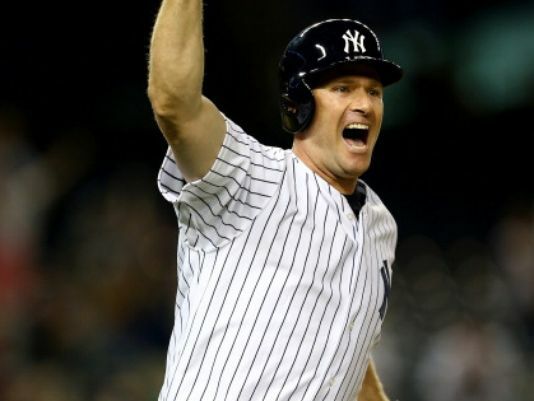 The latest is a reported (by Yahoo Sports’ Jeff Passan) four-year, $65MM offer for free agent third baseman Chase Headley. No matter how much the owners complain, they still make ridiculous offers and this is certainly one. Headley, who has a fabulous glove, has not been productive at the plate since his one huge year that made baseball stand up and take notice. Maybe it was fear that the Mayans would be right, but Headley hit in 2012 like his life depended on it. The Padres third baseman hit 31 home runs, had 115 RBI, and an .875 OPS. Numbers that Headley has not approached before or after 2012. Prior to his trade to the Yankees at this past season’s deadline, Headley had a .651 OPS in 77 games with San Diego. In 58 games for the Bronx Bombers, Headley had a respectable .768 OPS, but he was a non-factor in August before a hot streak in September gave him decent numbers, in a small sample (58 games), in pinstripes. The Yankees made the mistake of giving Ichiro Suzuki a two year deal after one hot month in 2012. While Headley is much younger than the Ichiro, he has nowhere near the Hall of Fame career the Yankees gambled on when they gave Ichiro a new contract prior to the 2013 season. Headley seems like a good guy and flashes the leather with the best of them, but I would not be happy if that four-year, $65M deal was offered by a team I was a fan of. CSNNE.com’s Sean McAdam reported on Wednesday that free agent pitcher Jon Lester was “likely” to make a decision on his future by the end of the week. Why McAdam felt that way remains to be seen – is this from a source or sources, or a hunch? – but there are reportedly four teams in on the bidding. Speaking of the A’s, they are reportedly shopping Brandon Moss, who had offseason hip surgery. Moss, once touted as a prospect, floundered in the Major Leagues until he arrived in Oakland. He had 21 HR and 52 RBI in a little more than half a season in 2012 and followed that up with 30-87 and 25-81 the last two seasons as a first baseman and outfielder. He was selected to his first All-Star team in 2014. In his second year of arbitration eligibility Moss would get a bump from the $4.1MM he earned last season. The kind of money that does not fits into GM Billy Beane’s budget. The deal that took place Wednesday night between the Toronto Blue Jays and Seattle Mariners flew under the radar, but could have a fairly significant impact on both teams. Seattle sent outfielder Michael Saunders to Toronto for left-handed starter J.A. Happ. Saunders missed 1-1/2 months of baseball due to a strained oblique, which was unfortunate since he was arguably having his best season in the Majors. He finished with a career-best .791 OPS and had 8 HR and 34 RBI in 78 games. With Jose Bautista entrenched in right field, Saunders will slide over to left field to replace Melky Cabrera. GM Alex Anthopoulos made the move knowing that the Melkman preferred not to return to Toronto. It’s the third time that Happ has been traded, with his value diminished in each deal. He was part of a package that the Philadelphia Phillies sent to the Houston Astros for Roy Oswalt at the 2010 trade deadline. He was part of a deadline deal again two years later, when Houston sent him, and pitchers Brandon Lyon and Dan Carpenter to Toronto for outfielder Ben Francisco, reliever Francisco Cordero, and five minor leaguers. Happ made 26 starts and four relief appearances for the Blue Jays last season and finished with an 11-11, 4.22 record. He struck out 7.6 batters per nine innings, which was down nearly 1.5 strikeouts since 2012. Happ made just 18 starts in 2013 after being struck in the head by a comebacker off the bat of Tampa’s Desmond Jennings. So if Happ is to start, who does he replace? Seattle’s rotation, prior to the deal, consisted of Felix Hernandez, Hisashi Iwakuma, James Paxton, Taijuan Walker, and Roenis Elias. Paxton was limited to 17 starts – 13 with the Mariners, four in the minors – after undergoing left shoulder surgery in October, 2013, but he’s still highly thought of. There have been rumors that Seattle was shopping Iwakuma, but GM Jack Zduriencik flatly denied that was the case. Taijuan Walker was the 43rd overall pick in the 2010 draft and is one of the top prospects in baseball. That leaves Elias, who was a surprise rookie success in 2014. In 29 starts, the Cuban-born right-hander struck out 7.6 hitters per nine innings pitched, gave up less than a hit per inning and put together a respectable 3.85 ERA. He finished 10-12 three years after the Mariners signed him as a free agent. 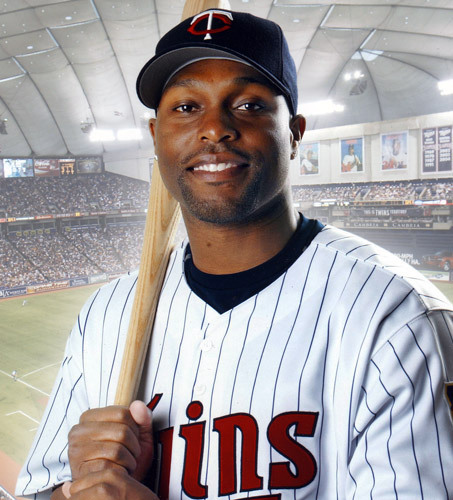 Prior to leaving as a free agent after the 2007 season, Torii Hunter spent 15 years in the Minnesota Twins organization. He was the 20th overall pick in the 1st round of the 1993 MLB Amateur draft and made his Major League debut four years later. Hunter spent the 2008-2014 seasons with the Los Angeles Angels and Detroit Tigers, but he’s coming home for 2015. Hunter will spend his 17th full season in the Majors back where it all started. The Twins and Hunter agreed to a one year deal Tuesday that will reportedly pay him $10.5MM. According to ESPN.com’s Jayson Stark, the Texas Rangers and Baltimore Orioles were also interested in signing Hunter. The nine-time Gold Glove winner averaged nearly 20 home runs and 85 RBI in his six years out of a Twins’ uniform. Best known for the spectacular defensive play that he made look routine, Hunter was a full-time centerfielder until the 2010 season. He then became the regular right fielder for the Angels and Tigers. Hunter called the Metrodome home when he was with the Twins and will have to get used to playing full-time in the Target Field outfield. While the Twins don’t currently look competitive for the postseason, Hunter will also serve as a mentor to some of the younger players on the roster. He’ll also be playing in Minnesota for the first time without Tom Kelly or Ron Gardenhire as the manager. Gardenhire was fired after this past season and was replaced by Paul Molitor, who was a member of the 1997-1998 Twins when Hunter made his debut. Hunter is 8th all-time on the Twins home runs list with 192, nine behind Gary Gaetti. He’s also 5th all-time in strikeouts with 870, seven in back of Gaetti. Hunter, who will turn 39 in July, has played in the postseason eight times but has never made it to the World Series.